The Sixth Extinction 7×3: Some truths are not for you. Don't be subtle or anything, Mulder. It’s tough being a middle child and “The Sixth Extinction” is the somewhat forgotten child sandwiched between two attention-hungry siblings. “Biogenesis” (6×22) is about the origins of the universe while “The Sixth Extinction: Amor Fati” (7×4) contemplates the coming of the messiah. (Grandiose much?) Bracketed by such life-altering concepts, what job is left for “The Sixth Extinction” to take over? What I like about this one is that it’s more action oriented than either of the other episodes. Between the plagues, the apparitions, the zombie… Chris Carter was clearly trying to bring the show back to its creepy roots and I appreciate that. I also wholeheartedly welcome the return of Michael Kritschgau. One wonders what his character must have felt when, after all Kritchgau did for him, giving up his job and his reputation to testify for Mulder, Mulder stops listening to him and turns back to his alien ways. Briefly the thought crosses my mind, “Since when was his character involved in Remote Viewing experiments and since when did Mulder know that?” but it’s quickly hushed. Maybe Mulder can read minds from across the city. I don’t care. What’s a plot point or two between friends? And some might find his scenes in the hospital with Mulder and Skinner boring, but I think they’re a lot of fun. It’s always a treat to see Skinner get in on the action and I believe his heavy presence here is a harbinger of things to come this season. He doesn’t get his own episode, per se, but he comes out from behind his desk in a major way. I’m also surprised to hear him admit so freely his belief that Mulder’s disease is extra-terrestrial and I suddenly realize that while Skinner’s been involved in the mythology of The X-Files since Season 1, he’s always been on the human side of the plot. To my recollection, he’s never said one way or the other whether he believes the Syndicate’s conspiracy was hiding the truth about alien life, though I suppose his support of Mulder all these years is evidence to that effect. 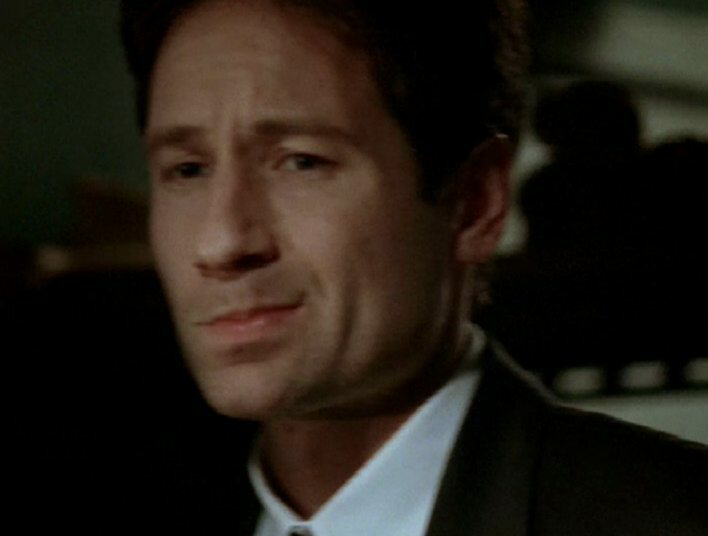 As for Mulder, I’m dying to know what he’s thinking now that he knows what everybody else is thinking. Ultimately, mind reading is a power I wouldn’t want. Some things are better not to know. But I relish the chance to experience it vicariously and watch Mulder waste away in (mostly) silent angst. I may even have to rethink my position on that cut scene from “Biogenesis” where Mulder confronts Diana Fowley. Yes, that knock-down, drag-out would have been awesome. But if it had happened in the previous episode I would have been robbed of the thrill of realizing that when Mulder says, “They’re coming,” it’s Diana he’s referring to. Oh, how vindicated I still feel to finally know once and for all that he’s onto her. Now we come to what I think is the most interesting part of this episode, and not just because I’m a Shipper. Carter sets up two scenes of bedside vigil for the dying Mulder, one with Diana Fowley and one with Scully. We’re invited to compare and contrast their reactions to Mulder’s condition, to the answers that he’s found, and the knowledge that he has, even the knowledge of their own thoughts. Fowley professes her love for Mulder, and since we know she knows that he knows what’s going on inside her head, she must be telling the truth. She also confesses her allegiance to the Cigarette-Smoking Man, which she defends, though at least she has the grace to look a little embarrassed about it. Most importantly of all, she reveals what sounds like her primary motivation: she and Mulder can be together now that he knows the truth. Maybe it’s just me, but I get the impression that she’s wanted to tell Mulder all of this all along but couldn’t either because to do so would be to betray her mission within the Syndicate or because she knew how Mulder would react and that she’d lose him forever. Now she’s hopeful that since he can see into her motivations and her reasons, he’ll understand and agree and they can walk into colonization hand in hand, two alien-human hybrid lovers together forever. Does this woman creep anyone else out? Seriously. I was having flashbacks of Kathy Bates in Misery. Don’t get me wrong; I’m not so cold-hearted that I don’t feel bad for her. But it’s plain now that she’s doing the wrong things for the wrong reasons. She loves Mulder, yes, but it’s a selfish sort of love. She doesn’t want what’s best for him, she wants him for herself. All this time she’s been plotting and scheming, or going along with someone else’s plots and schemes, in hopes that one day she could have Mulder for good with out any pesky alien colonization getting in the way. Since Mulder plays possum the entire time she’s in the room, I’m going to put it out there and say her chances are looking slim. It’s hard to say what Mulder’s thinking at that moment, but the fact that he masks his awareness in front of Fowley tells us all we need to know. However sincere her feelings may be, he can’t trust her; she’s still on the wrong side. By contrast, we can see Mulder struggling to focus on Scully when he realizes she’s coming into his hospital room. And what does Scully do when she reaches him? Does she pounce on his silence as an open opportunity to confess her love? No. All she does, all she beautifully, perfectly does is beg him to live. That’s it. She just needs him to hang on. I don’t even need to comment further – the selflessness speaks for itself. I have to say that “The Sixth Extinction” is better than I remembered. I’m still not and never will be sold on the premise. (Was the aliens’ master plan to throw the world into confusion by inundating them with conflicting doctrines? Is this a Tower of Babel scenario? Create disunity so mankind can’t get up to too much mischief?) It feels absurd in a way that even alien abductions and a conglomerate of rich old men running de-humanizing tests on an unsuspecting public didn’t. Methinks the origin of life is too vast a topic to handle in primetime. But if you’re going to do something, do it well, and the scope of this production ultimately keeps my interest even if I’m not jumping up and down with excitement. The focus is quickly shifting from God, aliens, and the origins of the universe to Mulder and the personal consequences of his quest. Early on in the episode, even in his tired state, he seems excited about what he is, happy despite all his suffering to have become the proof he’s been searching for all this time. And yet I start to wonder. Kritschgau: How far should it go?! How far would Mulder go?! He’s dying. Mulder has proven many times before that he’s willing to die in this fight, to die for his cause, but does he actually want to? Is it possible that even Mulder, trapped as he is in silent torture, has a limit? Ah, but then just when I find myself ready to get excited at the emotional possibilities… This. Dr. Ngebe: It is the word of God. Hmm. Scully’s hair grew and Mulder’s hair shrank. Mad props to David Duchovny for best performance of a mute paralytic ever. Whatever else we get or don’t get from this episode, Scully wielding a machete is pretty cool. 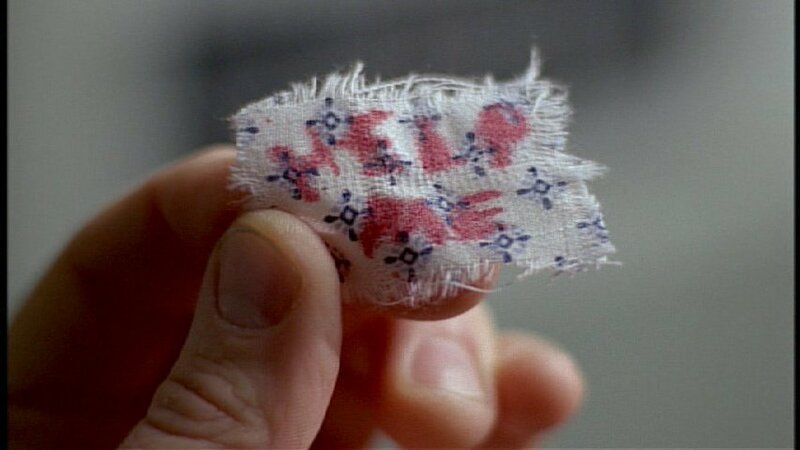 Mulder wrote that note to Skinner awfully neatly for a psychotic man writing in his own blood. I love that brief shot we get of Skinner from the POV of Mulder’s strapped down leg. It emphasizes how vulnerable Mulder currently is. Scully looks awfully fresh for a woman who’s just come off of a 22-hour flight. Scully’s continuing monologue in Mulder’s direction reminds me very much of “Memento Mori” (4×15), only this time Mulder’s the one that’s dying. I wonder why Mulder attacks Skinner in order to give him the note. Perhaps he didn’t want the doctors, and therefore Diana, to know what he was thinking? Why is Scully’s tent clean from the outside even though it’s a white tent and bugs are sticking to the inside of the material? Kritschgau is no longer in the military so where did he find or how did he afford this equipment to test Mulder with? And how did they sneak it into the hospital? When she threatens him with a machete, Dr. Barnes says to Scully, “Word is you’re under suspicion already!” Suspicion of what?? Killing Dr. Merkallen? He was dead before she came on the case. Killing Dr. Sandoz? She was back in D.C. by then. Is this just a haphazard attempt on Dr. Barnes’ part to deflect suspicion off of himself? Why would Scully go all the way to the F.B.I. to find out if Mulder’s still at the hospital? You’re a doctor. Call the hospital. Gibson Praise, well over a year ago, described what it feels like to read minds as hearing lots of different radio stations on at the same time in your head, which seems to be exactly what Mulder’s experiencing. I wonder then, why didn’t Gibson experience side effects? Was his body already used to it because he was born that way? Had his ability been triggered by something alien as well? 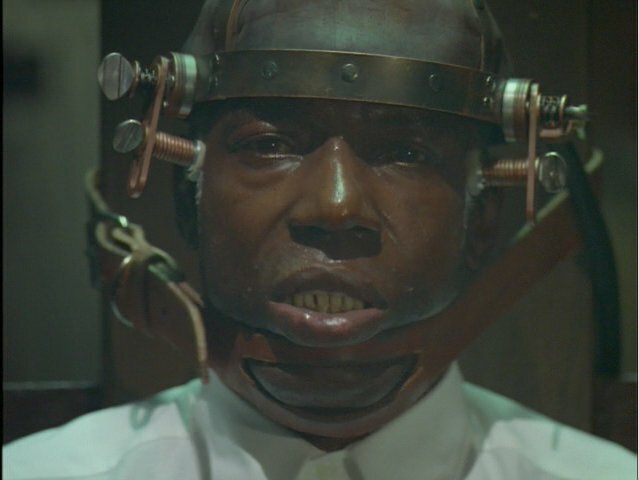 CSM did brain surgery on Gibson back in the day much in the same way that he’s about to do it on Mulder. What would make this surgery a more successful attempt at hybridization? Is it because Mulder was previously infected with the black oil? Skinner: I’m afraid it’s true. Scully: He’s not dying. He is more alive than he has ever been. He’s more alive than his body can withstand and what’s causing it may be extraterrestrial in origin. Skinner: I know. But there’s nothing to be done about it. Skinner: They’re going to deny you access. Scully: Maybe as his partner… but not as his doctor. The List 3×5: I just don’t see the motives, do you? The Green Mile it is not. Chris Carter is back in the director’s chair and I have to say I’ve missed him. I’ve always generally preferred his directing over his writing. In fact, his first foray into directing was “Duane Barry” (2×5) which would go well on anyone’s resume. And like in “Duane Barry”, it’s when he takes the helm as both writer and director that he really packs a punch. Sadly, “The List” is an exception to that rule. Visually, this episode rocks. Mulder and Scully are constantly swathed in ethereal blue and green lights. The prison is sufficiently claustrophobic. And let me just say, as a Floridian, the glistening sweat on the brows of the entire cast is sadly realistic. On atmosphere “The List” gets an A+. 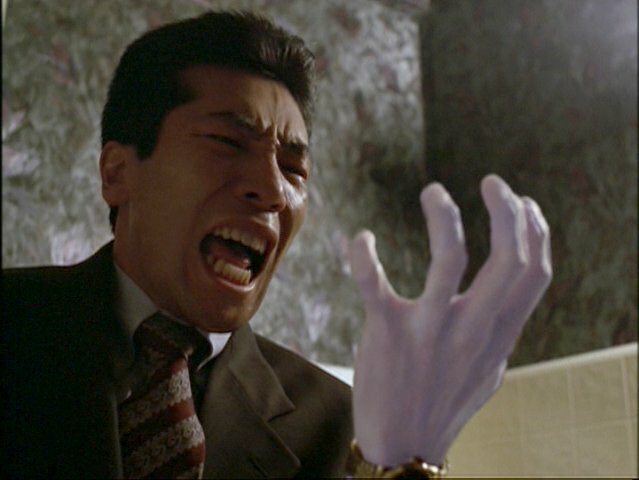 But the content of this episode is like the microwaved leftovers of “Fresh Bones” (2×15). General Wharton in charge of policing a refugee camp led by a spiritually sensitive, mystical black man is now turned into a Warden in charge of policing a prison led by a spiritually delusional, mystical black man. Both are propelled to their deaths by a resurrected mystical black man. Even the closing shots of their deaths resemble each other; the camera comes from above and goes “through” physical barriers to give us a glimpse of their final rest. I’m not mad at this episode for not being particularly original. In fact, sometimes I out and out prefer it when I get a tried and true X-File. But this one doesn’t bring any kind of new or fresh twist. As the series has progressed, the guest spots have been more consistently memorable and the acting has improved. Yet nothing I see here is enough to elevate “The List” above being merely mundane. Well… mundane for The X-Files that is. It doesn’t help that it ranks up there, for me, as one of the most confusing episodes of all time. Neech is supposed to be reincarnated, “reunion of spirit and flesh.” Instead, we get another ghost story very, very similar in content to “Born Again” (1×21). Another soul is reincarnated for the express purpose of bringing vengeance on a short list of enemies. Only “Born Again” at least gave us the protagonist reborn in the flesh. Where exactly is Neech’s reincarnated form? He only shows up briefly at the end of the episode and even then I’m not convinced. I’m beginning to think that we in the West are incapable of successfully translating the concept of reincarnation. It’s too foreign to our worldview. Speranzo: Well, he would have called it transmigration of the soul. Speranzo: You, me, this mattress… I don’t know, he didn’t specify. But he’s back. I can feel it. The man was electric, you know what I’m sayin’? Pure energy. From that I suppose we’re to infer that Neech has been reincarnated as some vague spiritual energy; in other words, as a ghost. So why bother to call it “reincarnation” you ask? Good question. I tend to not skip this one on rewatches. Not because it deserves it, but because it feels distinctly X-Filesian even if it isn’t particularly good. I’m not convinced that Neech Manley is a character worthy of his own episode. Maybe it would have been more successful if there had been a villain to latch onto, but as it is, none of the characters motivate the audience to either “Yay” or “Boo” in their honor. “The List” ends up as a footnote, a cross between “Born Again” and “Fresh Bones”, complete with a bitter, white taskmaster terrorizing his black prisoners for their spiritual secrets. I don’t know what you all are going to think of my IQ when I confess this, but after seeing this episode what must be at least 10 times I still have no idea who killed who. Did Neech commit all the murders? Where Parmelly and Speranzo in on this together? Then why did Parmelly point the way to Roque? Did Neech’s wife know? Did Neech ask these guys to kill for him after his death so that everyone would believe the myth and then, surprise of surprises, came back from the dead anyway? I’m lost. Lost, I tell you. I don’t know which lie to believe. Watch it once and enjoy the atmosphere. Watch it again and risk ruining it for yourself. Neech was on death row, probably with good reason. I wonder what some people might have done to him if they could come back from the grave and exact revenge. It’s nice to see Scully a little shaken up in the prison. Any woman would be on edge. I believe “The List” wins the trophy for most maggots ever in an episode. Scully: Like what, the secret password? Mulder: Okay, but imagine if it were true, Scully. Imagine if you could come back and take out five people who had caused you to suffer. Who would they be? Mulder: …I remembered your birthday this year, didn’t I Scully? *Editor’s Note: Actually, no, he didn’t. He won’t remember it until next year. Scully: Woman gets lonely. Sometimes she can’t wait around for her man to be reincarnated.